A few days ago, someone warmed my heart and made me feel special (again!). I’ve only been posting my thoughts for a couple of months, meeting new people and just recently been visiting other people’s homes. commented on one of my posts, I quickly visited her site and to my surprise, there it was - my first blog award. It was definitely a great treat! Natasha, creator of Thursday Sweet Treat, is a truly generous, friendly and talented person. She shares her passion for life and the arts, living her dreams and at the same time sharing her brilliance with everyone. Thank you for inviting me every week and giving me a needed “pat-on-my-back”. 2) Techy Mom’s Blog – for a “newbie” like me, information about anything technical is really helpful. She also gives me a nudge every now and then and don't forget to check Tasty Bytes site, where every bite looks yummy! 3) Pat and Mike’s Trips – This couple finally posted their travels! I love the pictures – giraffe lovers, you’ll get a special treat! 4) Ziggy’s Blogs – this “in-your-face” blog is a great guide for mothers with teenagers. Every time I feel like posting about some teen activities, she already got it covered. A quick note to all mothers – never assume or think “Not-my-child”. 5) Maneuvering Motherhood – Plenty to laugh about, so much humor and fun. Please grab your chair, get a cup of tea or coffee and take time to visit these sites. Such sweet treats for Easter, thank you! Hope you and your family are having a nice Holiday. OMG! That is so sweet. Thank you so much. I enjoy your blog too and I'm so glad you got an award. Feels good knowing at least a few people read, huh? Ms Behavin, You're welcome. I definitely feel loved knowing someone takes time to read my posts. Getting people to notice you is the toughest part of this whole process. I'm enjoying being able to share my thoughts...and someone is actually listening. Jenjen, You are amazing. Wow, thank you SO MUCH for the award. : ) TheMotherhood is all the better because of your involvement, love and incredible contributions. 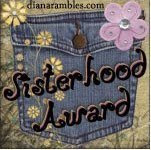 I am so happy your wise and wonderful blog was recognized - I love it! Big Hugs right back at you. I'll be visiting you this Thursday and hopefully come up with something to share. You're an inspiration and definitely thank you for your motivation.